Kodiak's 200 series pressure gauges are designed to meet the demands of heavy duty industrial applications. 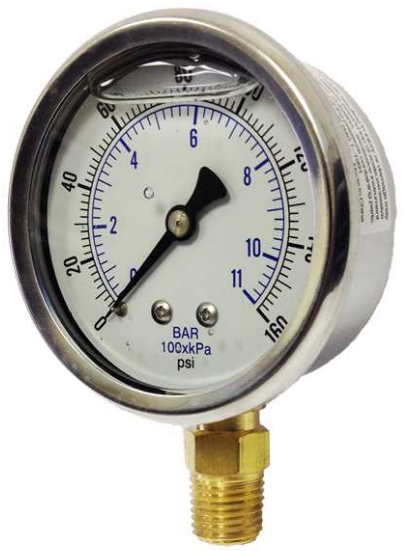 This series gauge is commonly used on hydraulic and pneumatic applications, pumps, compressors, chillers, or any other application that has vibration or needs a hermetically sealed industrial pressure gauge. Ashcroft® 1009AW Duralife pressure gauge has been upgraded to include a ventable plug that can be sealed or vented depending on the environment and through-dial recalibration that reduces recalibration time. It has the finest gauge technology for vibration, shock and pulsation applications. ENFM® series 7710 liquid filled pressure gauges are suitable for a medium which does not clog connection ports or corrode copper alloy. These gauges are commonly used on heavy-duty service in industrial environments and are ideal for applications that require reading from a distance.